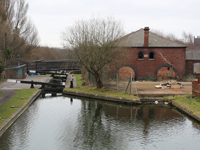 From Bromford Junction at the bottom of Spon Lane Locks go towards Wolverhampton on the New Main Line. Pedants might say that the first half mile of this walk is along the Wednesbury Old Canal as it's a stretch incorporated into Telford's new canal but we'll let that lie. You'll notice first the Bromford Stop Island with its collection of beer bottles from around the world. The landscape is familiar with barking dogs guarding factories and a series of walkers restraining their own fierce dogs on the towpath. One lady, with a Bullmastiff as big as herself, reassured me that 'he's alright on a lead, or else he would have pushed you in the cut'. You now pass two unlovely bridges over basins on the far side of the canal near Izon Old Turn (named after a local iron founder). The second one served Piercy's Brickworks, later Hamblet's Blue Brick Works, where the finest bricks in the Black Country – and hence the world – were made until it closed in 1915. The basin would have been opposite part of the original canal line which is now filled in after closure in 1954 but looped around to Pudding Green. With the Pudding Green Junction behind you, the main line arrows through the Black Country. Passing factories making very loud and odd sounds, you wonder what on earth is going on inside. Beer cans are mysteriously joined by a multitude of bread wrappers all over the place - they certainly like their Kingsmill around here. Somewhat more off putting is a dead pit bull dumped in a black bag, his fighting days over. Union Furnace Bridge brings to mind the type of local industry that once dominated the landscape. The bridge is dedicated to Tojo The Dwarf, but where he fits into the story I have no idea. The Gower Branch (1835) departs from Albion Junction, but continue on the Main Line and you pass a beer can carpeted wood adjacent to the Dunkirk Stop Island. You are now high above the River Tame, which passes under the canal through the Moors Aqueduct. This embankment suffered a huge breach in the autumn of 1899 draining six miles of the canal and drowning the adjacent brickworks. On the left but out of view is the Rattlechain Lagoon, an old clay pit used by Albright & Wilson as a hazardous chemical waste dump. You really wouldn't want to go swimming in it. Next up are the superb bridges around the Netherton Tunnel Branch at Dudley Port Junction. There's now a series of aqueducts and after the Dudley Port Station Aqueduct look out for the rather ugly railway bridge spanning the former Dixon's Branch that departed to the famous engineering works whose bridges span the BCN and who built the first iron clad steam ship at Horseley Heath. Keep on and you'll reach Watery Lane Junction where the Tipton Green and Toll End Communication canal cut across the main line. You can still walk along the Tipton Green stretch opposite to Caggy's Yard (named after legendary boatman Caggy Stevens) where boats moor and anglers fish, and the Friends of Tipton Cut keep the towpath tidy. Go under Tipton Station Bridge and you'll notice the entry to the Three Furnace Branch that went under the station and served Tipton Green Furnaces. A little further, and at the bottom of the three Factory Locks that raise the canal 20ft to the Wolverhampton level, cross over the cute Horseley footbridge. Tipton Factory Junction is probably named after James Keir's alkali and soap factory which was located just beyond Factory Bridge. Keir was a Scot and friend of Watt, Boulton and Priestley, a member of the Lunar Society, he had a impressive CV before making the Black Country his home. At the top lock there's the old gauging station built in 1873 and the much altered 1892 Boatmen's Mission (the other surviving example is along Walsall Locks on the Ryders Green - Birchills Junction Walk). Turning left towards Birmingham on the Old Main Line, on the far side of the cut there's the 1845 Malthouse Stables restored in 1982. On the towpath side, industry is soon replaced by housing but at Owen Street Bridge you should find time to visit the Fountain Inn, former HQ of champion prizefighter the 'Tipton Slasher'. His statue stands in Coronation Gardens, a former wharf and basin at Tipton Green Junction. Here the Tipton Green Branch (opened 1805, closed 1960) departed and joined up with the Toll End Branch, forming a link with the Walsall Canal. Another quarter of a mile and the old line turns sharply left at Tipton Junction. Straight on is the Dudley No.1 canal that passes the Black Country Museum on its way to the northern end of Dudley Tunnel. To reach it you must cross Pitchfork Bridge and double back on the other side of the canal. Known as Lord Ward's Canal, it was constructed in 1778 to serve his lordship's limestone quarries. In 1792, the 3172yd Dudley Tunnel opened under Castle Hill to Parkhead. It has no towpath and there is no pedestrian access to the portal except through the museum. Back on the Old Main Line, there are trees and modern housing. You pass without noticing the former FMC wharf and warehouse at Dudley Port and then the redeveloped Tividale Quays Basin. The entrance to Keir's Bridge Arm, near to where Keir sank a coal mine to feed his factory, is still extant, and just around the next bend is the Tividale Aqueduct where you can use steps to descend to the Netherton Tunnel. For information on the tunnel see the Spon Lane Junction – Windmill End Walk.